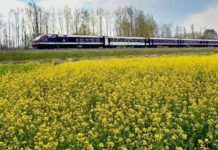 Nestled against the backdrop of the snow-capped Pir Panjal Mountains, Jammu also known as “The City of Temples” is the Duggar land where the past still has a living presence. A land of grand ancient temples, and beautiful palaces. The region of Jammu constitutes the southernmost unit of the state of Jammu & Kashmir. Amar Mahal Palace: Amar Mahal, located in Jammu, is a palace depicting grandeur of an erstwhile era. Ranbir Canal: A small garden along the Ranbir Canal, which runs through the city outskirts. Bahu Fort & Gardens: Bahu Fort stands on a rock face on the left bank of the river Tawi. Jasrota Mata: Patnitop is the most popular tourist spot of Jammu region. Mata Sukrala: A place for a quiet holiday, the meadow has now been developed as a golf course. Mata Sundrikote: This small town serves as the base camp for visting the famous shrine of Vaishnodevi in the Trikuta hills. 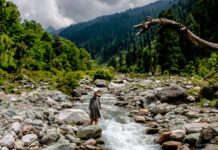 Mata Balaji Sundri: This resort straddles the forested slopes of the Patnitop mountain range, overlooking the spectacular lie of the Chenab gorge. Mansar Lake: Boating facilities are available in the spot. Every year around Baisakhi, a food and crafts festival is organised here by J&K Tourism. Purmandal: Often referred to as ‘Chhota Kashi’, its main temple is dedicated to ‘umapati’. Dera Baba Banda: It is a major Hindu-Sikh pilgrimage centre situated 75 Kms from Jammu. Peer Khoh: Peer Khoh is a cave shrine located on the Circular Road, 3.5 kms from the heart of the town. Peer Baba: Behind the Civil Airport is the famous durgah of the Muslim saint, Peer Budhan Ali Shah. Krimchi: On the way to Sudhmahadev-Mantalai, a short detour takes one to Krimchi, site of three of the oldest temples of Jammu. Jajjar Kotli: The crystal clear, cool water of Jajjar attract picnickers in large number during summer. Akhnoor: This town is associated with the legend of Soni-Mahiwal. Salal Dam And Lake: The west of the Holy Shrine of Vashnodeviji is the Salal Dam and Lake. 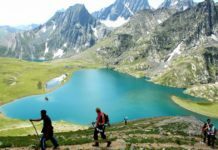 Baba Dhansar: On way to Salal Dam, Baba Dhansar is a beautiful and cool picnic spot. Raghunath Temple: Dedicated to Lord Rama, Situated in the heart of the city and surrounded by a group of other temples. Ranbireshwar Temple: This historic temple is dedicated to Lord Shiva. Mahamaya Temple: The city forest surrounds the ancient Mahamaya temple overlooking the river Tawi. Chichi Mata: It is situated near Samba and is popularly known as Pehla Darshan of Vaishno Devi pilgrims. Mubarak Mandi Palace: The architecture is a blend of Rajasthani, Mughal and even baroque elements.